If you are looking for a solution for replacing your factory steering wheel with a race steering wheel without permanent modifications, we have everything you need. We are the only one on the market that has an adapter for the 5th Generation Camaro. The 5th Generation Camaro has a very unique steering wheel mounting system so no adapter has been commercially available until now. It accepts most standard 6 bolt steering wheels. 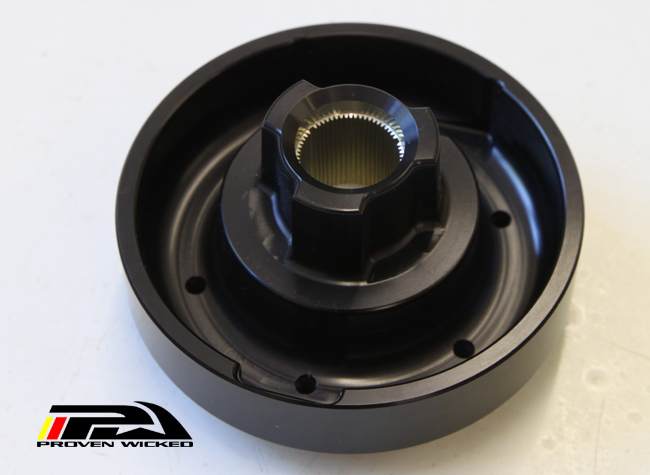 Its machined from billet 6061-T6 Aluminum and finished in a Type III black hard anodize. The splines are pressed in with a custom made broach taken from GM prints for the utmost in strength and accuracy. We also carry Sparco steering wheels and quick release hubs for the ultimate race setup. NOTE: This is for off road use only since it eliminates the factory airbag.